You may be wondering which web hosting company is a good fit for my small business. If you are looking for an easy way to get online with a customize site builder, Yahoo may be your answer. Yahoo Small Business is known as Yahoo Small Business now. 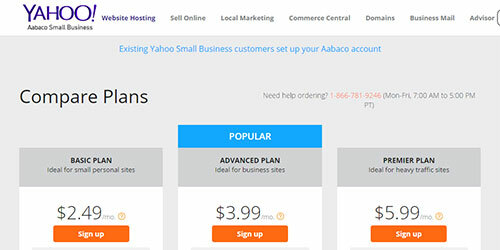 Yahoo small business hosting gives you a full customize website in a matter of minutes. With no downloads, installed software, or tech experience needed. Yahoo web hosting gives you the basic building blocks. Cutting out the need to know any knowledge of web development. Throw in a FREE domain name, what else do you need? If you are taking advantage of Yahoo's site building tools, you will notice how easy it is. You can customize your full site's design with flexible page layouts. Use the photo comparison to showcase your before and after changes before going live. They also give you interactive and multimedia features for your site. This gives you the ability to publish photo and video galleries with full integrated slideshow. Full tracking and reporting are available for your marketing strategy. This gives you inside information on your site's traffic statistics and search engine rankings. With referrer, keyword, and linkback tracking you will know how your customers are finding you. Their server a reliability and secure. They guarantee 99.9% uptime, with asset caching and load balancing across all servers. This keeps your site running at top performance even under heavy traffic spikes. With your Yahoo hosting plan you can view your see what's happening on your site on your mobile phone. You can use Live Insights iPhone app to stay updated with your site's key metrics. Keep an eye on the important things like traffic and revenue. With the mobile phone app, you can even chat instantly with visitors that are on your site in real time. This can help you clear and confusion or help them close the sale. There are others that have taken advantage of Yahoo's site builder. Getting their website's live to help their growing businesses. Jeffrey Wilson from pcmag.com writes. These days, it's difficult for a company to thrive without a website. And selecting the right Web hosting service is a vital part of building a Web presence. Yahoo Small Business (starting at $3.74 per month) lets you quickly build a basic website. Jeffrey knows how hard it is to find a good web hosting service. With using Yahoo, he was able to get a basic site live quickly and easily. Yahoo web hosting has served me and my company(s) for more than 4 years now. We have never had our site down (Yahoo performs site backups hourly), have never had any problem that couldn't be resolved, their technical staff are well informed (but their sales staff are garbage), they have excellent communication via email and phone support, and Yahoo has a lot of options for the professional. Tom has had great success with their performance and uptime. He also has peace of mind with the snapshot backups every hour. If something ever to happen, he would lose any data. They offer their different plans, a Basic, Advanced, and Premier. This review has been focusing on the Advanced plan as I feel this the best value. The Basic plan limits the number of pages your site can have. With capping the limit at 10 pages, this doesn't seem like enough for any type of small business. The Advanced plan is overkill for what most small businesses need. They give you a high amount of disk space and bandwidth, which is more than you will ever need. Choose the Advanced plan, this gives you plenty of disk space and bandwidth. With the ability to have unlimited site pages. Take advantage of the site builder, snapshot backups and $100 in ad credits. To get a small business site up and running in a matter of hours, it is definitely worth trying. Add in 99% uptime, backups, and other great features, it could be your answer to a provider. If anything goes wrong within the first 30 days, they have a money back guarantee.